Waterloo Brewing Company is Ontario’s first and largest craft brewer. As their thirst for exceptional craft beers has spread, they have stayed true to what they believe are deeply shared Waterloo Region values: quality, craftsmanship and a spirit of innovation. The Waterloo Brewing Company brews four core beers, created to be enjoyed year-round. Waterloo Dark was their first beer, and remains their most popular brew with several awards behind it. Waterloo Amber has a strong, rich flavour, while Waterloo Pilsner combines a perfect balance of subtle sweetness and velvety bitterness. Their Waterloo IPA combines the citrus and floral hop aroma of American IPAs with the sweetness, body and finish of British-style India Pale Ales. Waterloo Brewing Company also creates seasonal brews, including a limited brew Festbier which was created for Bingemans in honour of their Oktoberfest celebrations. The beers at Waterloo Brewing Company have received many accolades and awards, including Ontario and Canadian brewing awards as well as seven awards from Monde Selection in Belgium in April 2016. The brew house at Waterloo Brewing Company uses centuries-old brewing methods, but it’s also designed for the future. In August of 2015 they unveiled a state-of-the-art brew house. The facility includes Bavarian brewing technology and equipment that ensures sustainability in the brewing process through improved material utilization, lower energy consumption and reduced waste and wastewater discharges. This has reduced the company’s carbon footprint significantly. 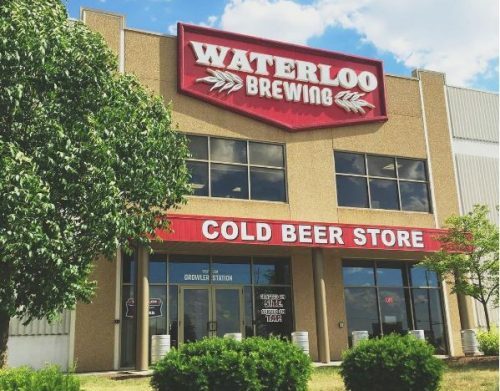 Waterloo Brewing Company has a full retail store, allowing visitors to fill up growlers fresh from the tap as well as pick up bottles and cans from a series of fully stocked fridges. And about the boar’s head featured on Waterloo Brewing Company’s logo and packaging? Over the centuries, the wild boar has symbolized strength and courage. Beginning with their very first batch of Waterloo Dark in 1984, the words ‘Pour the Boar’ have inspired their brewmaster with the courage to craft wildly interesting beer, without the compromise of haste, inferior ingredients or passing trends. The Preston Towne Market is a seasonal, outdoor farmers’ market that is open Thursdays from 9 am to 2 pm in Central Park in Preston. The market, founded in 2010, features many vendors and hosts events.